The witches pyramid, simply put, is a tool for wiccans and witches... a sort of how to order on practicing magic. I have seen many, many people interested in wicca who want to skip the learning stages and go straight to practicing magic and rituals. This is a big no no! How can you expect a spell to go correctly if you dont know the reason behind the tools or words. How can you expect it to not backfire on you if you do not do your homework? 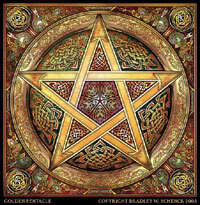 I myself studied wicca for an entire year before I even cast my first circle and shortly after cast a spell. I have also met beginners who want to start off writing their own spells with out even trying one that is already written and proven. Know the spell you will be casting. Familiarize yourself with the tools. Know the purpose of each tool and word you need for the spell before performing it. You must gain all the knowledge you possibly can. Read books, grimoires and book of shadows. The more you learn the more adept and focused you will be while performing magic. Know the spell you are doing and what it will achieve. the discipline portion includes your everyday home life as well. To practice magic you must make a commitment to see through what you start. Living up to your life goals is included here. Dare to do magic and experiment with what you have learned. But do it without hesitance. If you doubt yourself your spell will be affected. Dare to deal with your own darkness. Do not cast aside fear but learn to live and deal with it. Fear is a necessity in life. Once a spell is performed, don't dwell on it. Even after performing the spell your thoughts can still power it in one direction or another. Silence is also talking about the stillness of your ritual. You must be grounded and connected with the earth or the Gods. You can not hear anything if you are not silent. Do not share practices with those who are not practiced in the craft. This is to prevent them from trying something foolish. Experiment, try new things,make mistakes and learn from them. Set yourself free! Now the meaning for each pillar of the pyramid can be different from tradition to tradition but this at least is a foot in the door for you. Everything can be interpreted differently form person to person and there is no wrong or right way for everything, the only way for to know your own interpretation is to study and practice and live.